Oil four ramekins with a capacity of just over 250 ml (1 cup), then set aside. Cut half of the cucumber into small cubes (remove seeds if desired), then divide cucumber cubes evenly between the ramekins. Set aside the other half for later. Cover the diced cucumber with the diced mango, then set aside. Remove the skin from the duck confit, then debone. Dice the meat into small cubes, then mix with the green onions. Distribute the mixture between the ramekins and season with white pepper. Drizzle each serving with 10 ml (2 tsp) of the mint and soy vinaigrette. Lightly compress each serving using the back of a small fork. Cover each serving with plastic wrap and refrigerate for 1 to 48 hours. Just before serving, cut the rest of the cucumber in half width-wise, then into thin slices. Set aside. Take the ramekins out of the refrigerator, then slide a small knife around the inside edge to release the filling slightly. Cover with a medium plate, then invert each ramekin and give a sharp tap to release the filling from the mold. Arrange the cucumber slices decoratively on each plate. Drizzle with some of the mint and soy vinaigrette, and set aside. Place a few cheddar slices on the pita quarters and toast for a few minutes under the broiler. Place 1 to 2 pitas on each plate, then sprinkle with sesame seeds. 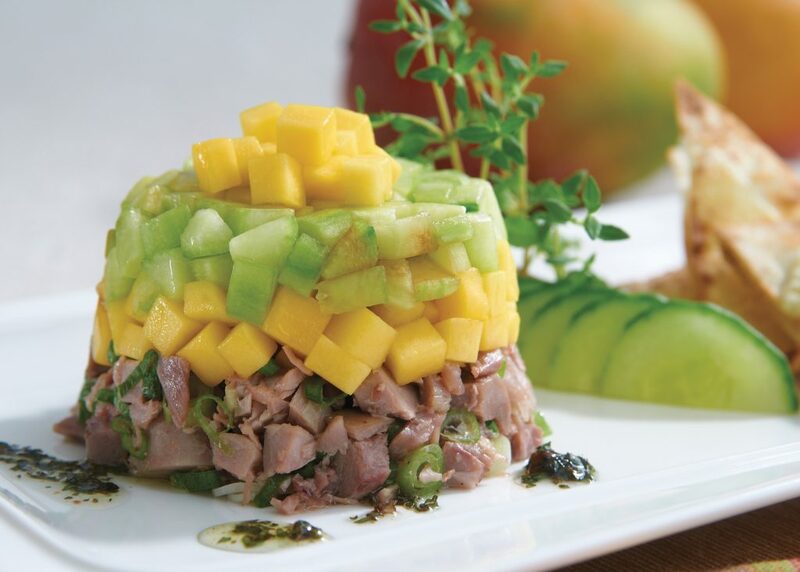 Decorate each layered duck confit with a few of the reserved mango cubes and serve immediately. Place all ingredients in an airtight container, and add pepper to taste. Shake well, then use immediately or cover and keep in the refrigerator. This recipe can be prepared well in advance and quickly assembled just before serving. Ideal for when friends are coming over.